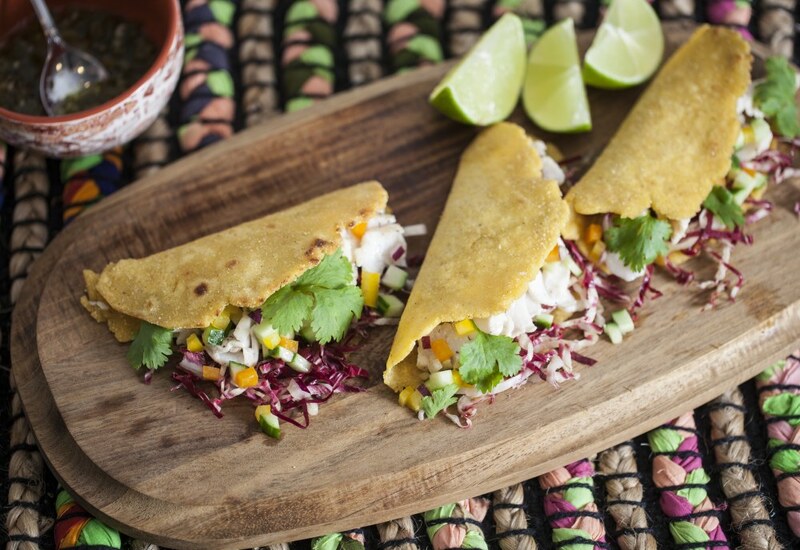 The flavors of Mexico and Thailand come together in these delicious tacos. Making your own tortillas is an extra step, but they add so much flavor and texture to an otherwise deceptively simple dish. If you don't have time, buy the best tortillas you can find, preferably handmade. The tortillas are topped with citrus-marinated sea bass and a crunchy, slightly bitter radicchio slaw. The tacos are drizzled with an aromatic Thai chile oil for heat and zest. If you can't find good sea bass, any firm white fish will do, such as halibut, cod or snapper. You can prepare ahead of time for this recipe by marinating the fish overnight and rehydrating the masa harina flour at the same time. The cooked tortillas will also store well in the refrigerator in a sealed ziploc bag for up to a week. Toast on a griddle or skillet before serving. Per Serving: 366 calories; 26g fat; 29.0g carbohydrates; 8g protein; 9mg cholesterol; 476mg sodium. These fish tacos are perfect! I didn't use sea bass but was lucky enough that my husband caught delicious fish from the Gulf of Mexico and we used that instead. Amazing! Also, the Thai Chili Aioli is addicting! These Thai chili tacos were so good. I've never cooked with sea bass before, and was pleasantly surprised by the taste and texture. Great date night meal. Not a huge fan of thai chili oil, but really enjoyed this recipe. The fish tacos are also very flavorful with the lime, peppers, and onion. Overall solid recipe, I really enjoyed this.